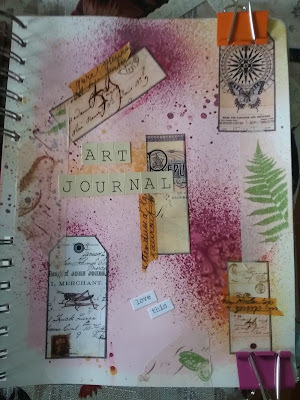 Things have been super busy lately and as much as I would like mixed media and art journaling to be my full time job, alas, they are still just a hobby. I use it to relax and de-stress and it certainly feeds my soul. When I don't have time to get creative in my journal or work on a canvas I start to resent all those things in my life that make me too busy for what I love the most. But here's the good news.... I have discovered coloring for ADULTS! This new way to get creative apparently, is all the rage! Who would have thought? I don't know what brilliant creative soul originally came up with this idea, it appears to have sprung out of the world of zentagles, but I LOVE LOVE LOVE it!!! I bought coloring books for all the youth in my Art Journaling class (we cleaned out the local bookstore) and all the gel pens the North Island had on hand. Every month there seems to be a new book available and now I hear Stampington is also releasing a color book/magazine in October. Here's the one thing I have learned that I want to share with you. Gel pens work the best. My Ink pens went through the page. Pencil crayons work also but I like the vibrancy of the gel pens. My Staedler fine tip felts also worked really well with no bleed through. I hear though that the publishers are using a better grade of paper in future publications that will stop bleed through. I also noticed some books only print pictures on one side of the page, not both. Chapters has a really great selection of these books and if you are on the Northern tip of Vancouver Island, The Booknook in Port Hardy has a great selection too. I hope you get a chance to try this out. Let me know what you think. This might be the beginning of a whole new movement in the world of mixed media. Maybe Tim Holtz will come out with a coloring book thats all goulish and steampunk. Wouldn't that be fun? For this project I choose 4 different colored papers which I tore in various sizes. I inked the edges with Tim Holtz Distress Ink to give the papers an aged look. I tried them out on the canvas until I liked the placement and then I used Matt Modge Podge to adhere the papers to the canvas. Then I sponged acrylic paint in an antique white to blur and soften some of the graphics and torn edges of the papers. For this canvas I started with some really nice textured paper I got on sale at Michaels. Sheets of pink, green and cream which I tore and inked with Tim Holtz Distressed Ink to age the edges. I find that this looks nicer than leaving the ragged edges white. I adhered the paper to a canvas using Modge Podge. I also added some pieces of flowered napkin. The napkin is three ply so I separated the layers so only the printed layer was used. Then I lightly sponged Titan Buff paint over different areas of the collaged canvas. I also painted the edges of the canvas to match the papers used. I used my favorite stencil from Crafter's Workshop to add purple swirls over the entire canvas. I outlined the swirls with a white paint pen and on some of the swirls I used Perfect Pearls embossing powder to add a lighter iridescent purple shade. Then I added pearls to the end points of each swirl. Three years ago I was working as a Counsellor for youth. I mainly worked out of the local high schools and so with the summer approaching my supervisor encouraged me to be creative in ways to keep the teens engaged in counselling over the summer.